In the end, it's still not a real watch—you have to charge it every few days, and it's a bit bulky compared to a mechanical watch. The Galaxy Watch does compare favorably to the other smartwatches on the market, though. The display is great, performance is snappy, and both notifications and navigation best Wear OS. And yet... this might not be a good time to drop more than $300 on a Samsung watch. Design The Galaxy Watch looks like a real watch, and the build quality is fantastic. Battery life Even the smaller watch gets better battery life than beefy Wear OS watches. Rotating bezel The rotating bezel is both satisfying to use and efficient for navigating the OS. Fitness tracking Samsung's fitness tracking is accurate and it can recognize dozens of exercises automatically. Notifications Samsung's wearable notifications are bundled like your phone's, so they're easy to scan at a glance. Apps Tizen has an almost total lack of apps. Watch faces are a little better, but you're still not going to have as many options as Wear OS. Bixby I would kill to have Assistant on this watch. Bixby is almost useless. Price The $330 starting price is steep when smartwatches aren't exactly a must-have accessory. Samsung Pay These watches are NFC only—no MST for non-NFC terminals. Timing Wear OS is getting a new UI and new Qualcomm chip in the coming weeks. Dropping cash on another smartwatch is questionable until we see how this pans out. The Galaxy Watch comes in two sizes, which I like to see. There's the 46mm version, which is really only suited for those with large wrists. The smaller 42mm watch is ideal for those of us with thinner wrists (this is the version I have for review). Most specs are identical between the two sizes. There's a dual-core Exynos SoC, 768MB of RAM, and a rotating bezel for navigation. Where they differ is the screen size (1.3-inches vs. 1.2-inches) and the battery capacity (472mAh vs. 270mAh). The resolution of the OLED display is the same for both watches: 360 x 360. There's an internal NFC antenna for Samsung Pay, but no support for MST payments on non-NFC terminals. 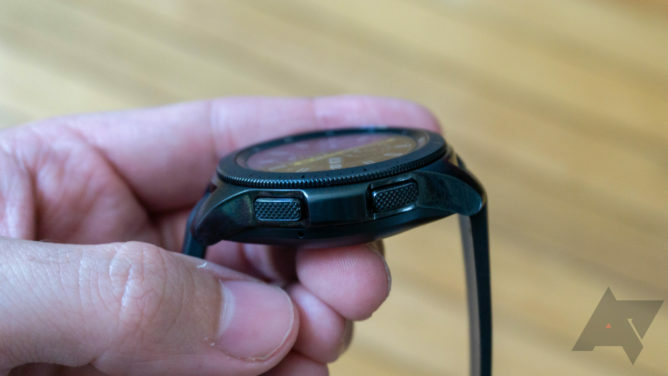 Samsung uses two buttons and a rotating bezel for navigation on its watches. The top button is back, and the lower one is home. Although, these are often functionally identical as you're rarely more than one step from your watch face. The rotating bezel lets you quickly scroll through long messages and move through the UI. Rotate right to see your widgets and left to access notifications. The upper body of the watch is aluminum, but the underside is plastic. The sensors live right in the center under a transparent window. The entire device is water-resistant to 5 atmospheres, so you can take it swimming without fear of liquid infiltration. That's tough to do with a speaker, which this watch has. The lugs angle downward slightly, keeping the band close to your wrist. 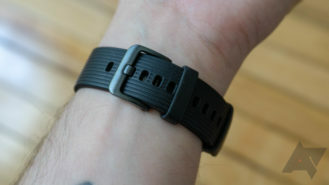 As for the stock band, it's a rather plain silicone one-size-fits-all deal with a quick-release pin. It's a standard 20mm band on the smaller watch and a 22mm on the larger one. It's a simple matter to swap out the stock band for a third-party one. 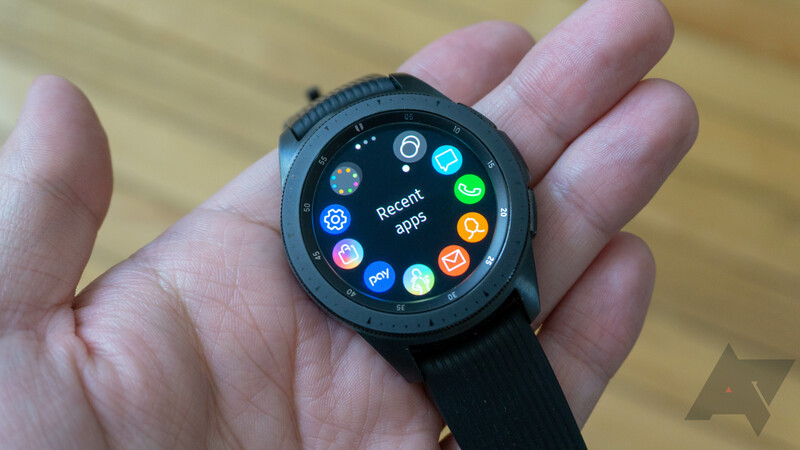 As mentioned above, this watch runs Samsung's Tizen OS, and it connects to your phone via the newly re-branded Galaxy Wearable app. Tizen does run apps, but they're housed in the Galaxy Apps store, which is accessible from the Galaxy Wearable app for non-Samsung phones. If you're using a Samsung phone, you can just use the Galaxy Apps client to download apps and watch faces. Samsung notes that the Galaxy Watch has enhanced fitness tracking capabilities. It recognizes more exercises without any user intervention, and it tracks your sleep if you wear it to bed. Despite the lofty price, the Galaxy Watch doesn't come with much in the box. There's the watch itself and the stock large band—past Samsung watches came with both large and small bands. There's also a wireless charging stand, microUSB cable, and AC adapter. Not right now. 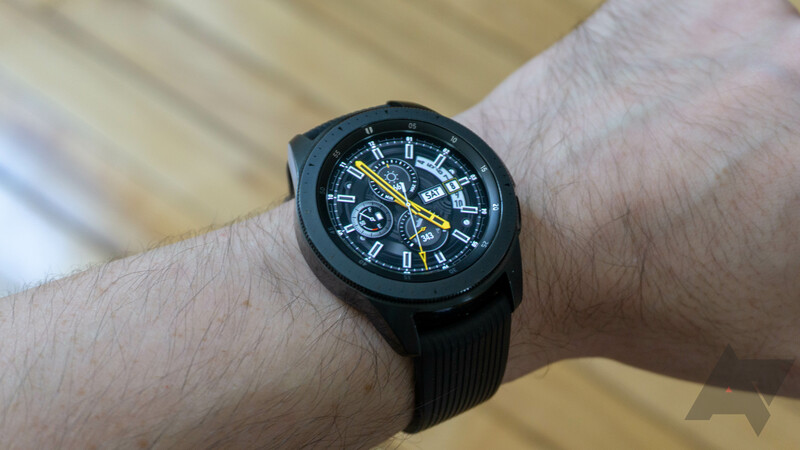 The Galaxy Watch is great at some things, but it's not a great time to go spending $330-350 on a smartwatch just as Wear OS is undergoing radical changes with a new SoC and interface. Even if I can't give the Galaxy Watch a full-throated recommendation, I do like using it. The rotating bezel is undeniably fantastic. It's a quick, enjoyable way to traverse the interface. It clicks as you spin it, so interfaces that are organized in discreet pages (eg. the widgets) advance one screen with each click. Tizen's UI can be a little cluttered at times, but the bezel and buttons make it totally manageable. The solid feel of the rotating bezel and buttons carries through to the rest of the watch. It looks like a "real" watch, and the build quality is excellent. The price tag is up there, but the hardware feels every bit as nice as I'd expect for the money. From a distance, it looks like an understated mechanical watch. I've had a few people ask what it was, unaware it was a smartwatch. From a distance, it looks like an understated mechanical watch. I've had a few people ask what it was, unaware it was a smartwatch. Samsung's round OLED display is also unimpeachable. The colors are vibrant, and viewing angles are perfect. It gets plenty bright for use outdoors, but there's no full auto mode for brightness. You have to pick a value between one and ten, and the watch adjusts around that. Fitness tracking continues to be one of Samsung's strengths in wearables. Samsung is right up there with Fitbit when it comes to logging exercise. 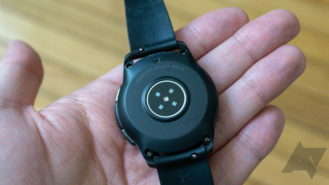 The Galaxy Watch tracks more types of exercise than previous devices, and it happens automatically. Usually within a minute of starting a workout (or just going for a walk), the watch begins logging the activity as exercise. It only brings up the active workout display after you've been at it for 10 minutes or more. 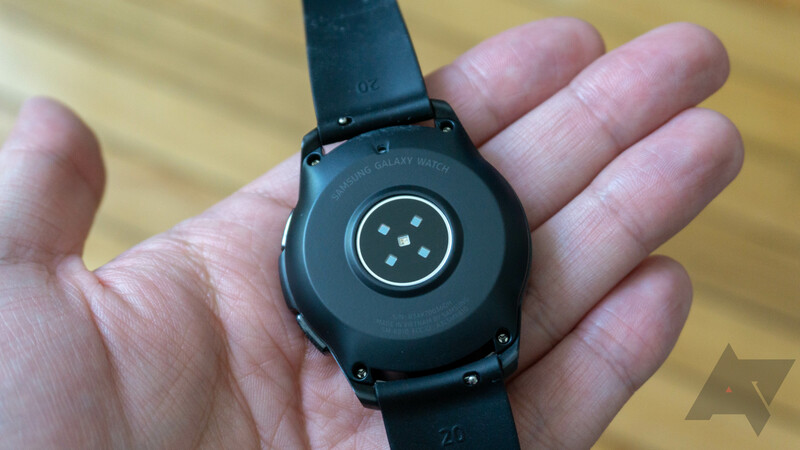 The Galaxy Watch also does sleep tracking; it's accurate from my limited testing, but the device is too bulky for me to wear comfortably all night. Samsung's battery life claims (3-4 days) assume you leave the watch in the default mode without always-on display. That seems like a silly way to use a smartwatch, so I always activate the always-on mode. You'll get close to Samsung's advertised numbers without the display on all the time, but you can still make it through about two days in always-on mode (again, I have the smaller watch). You could probably get more longevity if Samsung actually optimized for always-on mode, which it does not. The screen still updates continuously when it's "asleep." Tizen has some pain points, but the way it handles notifications is not among them—I like Tizen's approach much more than Wear OS. New items appear on the watch instantly, and they're bundled just like they are on the phone. So, if you have a stack of 10 unread Gmail messages, that's a single screen as you rotate the bezel to the left. You can tap to open the message previews and scroll through all the messages on your watch. The rotating bezel actually makes it feasible to scan through long messages on your wrist, too. I also quite like the customizable widgets that you can organize to the right of the watch face. One click over, and I get the weather. Another click and I have fitness stats. The app situation on Tizen is an ongoing problem, though. For all its issues, Wear OS has a lot of app support. I don't need a ton of apps on my watch, but there are some I want like Google Maps and Nest. Almost all the top wearable apps in the store come from Samsung—basic stuff like reminders, alarms, and stopwatch. There's a Spotify app, but it's rather bad. The stock watch faces are attractive, and there's a reasonable selection of alternatives in the store. Not as many as Wear OS or even Fitbit, but it's acceptable. Several of the stock watch faces have an optional ticking sound. That's a fun novelty for a little bit, but it's also totally unnecessary and distracting. I shut it off. The Galaxy Watch also lacks a capable voice assistant. It's nice that Samsung swapped S Voice for Bixby this time, but Bixby is only marginally more useful. It constantly fails to understand commands or says your request "is not supported." Bixby is about where Google's voice features were circa 2014. Samsung's latest wearable has some great aspects like notification management, exercise tracking, and solid design. I can even forgive some shortcomings like the poor app support. However, this just isn't the right time. 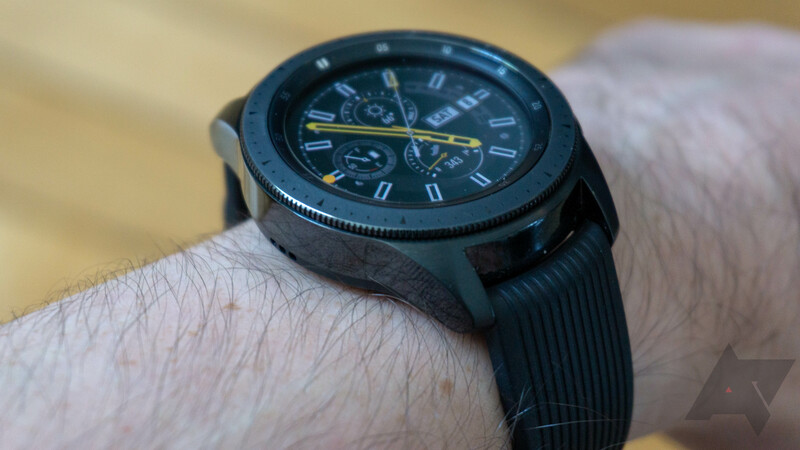 You should wait and see what the next few months bring for Wear OS and the Snapdragon 3100 before you drop $330 or more on a Galaxy Watch. 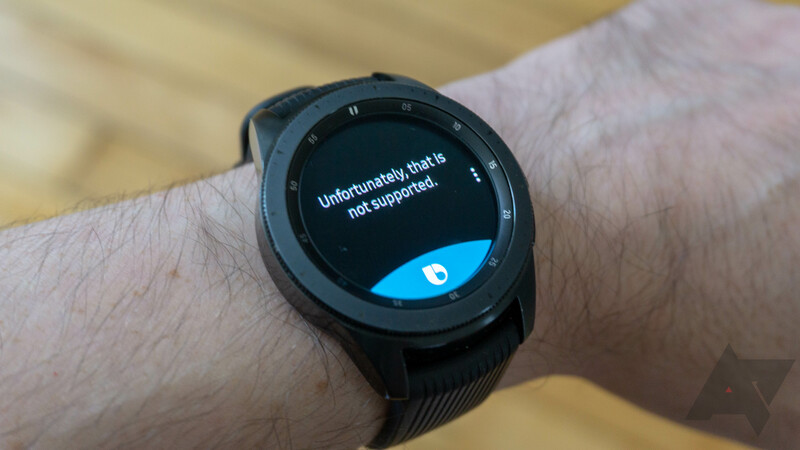 You want a reliable smartwatch that looks like a real watch right now, and you don't care about upcoming Wear OS changes. You're not comfortable spending a lot on a smartwatch, and it's not urgent that you get one. New Wear OS things might offer more compelling options.